Catherine Emmanuel is a Trinidadian/Canadian actor and producer. She started acting in Canada in 2003 and landed her first screen role in Disney's 2004 'Boss Girl' starring Kaley Cuoco and Megan Fox. 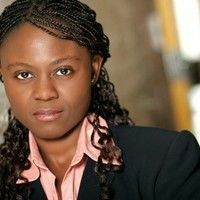 She studied improv at Toronto's renowned Second City Training Centre and has acted in award-winning films such as Maria Sødahl's 2010 drama 'Limbo' (Best Director, 2010 Montreal World Film Festival) and Damian Marcano's gritty 2013 release 'God Loves The Fighter'. As a producer, she started her documentary career in 2005 working on series and films for broadcasters such as Bravo! TV and ARTE. She produced 'Inward Hunger', an original documentary series on the life of Eric Williams for Channel 4/Savant Ltd. in 2011 and has directed campaign videos for non-profit organizations such as Habitat for Humanity® Trinidad & Tobago and KIND. Film (Short and Drama) Actress A bride to be finds out her abusive mother is released from prison and has trouble dealing with this news.